CBS’s 60 Minutes ran a segment about face blindness last night, and I figured I’d share some thoughts about it. If I could add captions to the movie, that would be fun, but I don’t know how to do that. So I’ll try writing a running commentary according to the time index of the video. 0:10 It’s been a while since I watched this program. Goodness, they are being dramatic, with correspondent Lesley Stahl giving her introduction from an endless black void with a creepy picture hovering behind her! I have never had trouble recognizing my close family members or myself in a mirror. And I was able to recognize my high school classmates right away at our reunion. But I’ve spent years with those people where I saw them on a daily basis and spent time getting to know them. I start to have trouble with people I only see from time to time. 1:20 This is something I’ve always wondered about 60 Minutes. Do they make sure that the stopwatch is always at the right minute and second based on when the commercial breaks come, or do they fudge things a bit? It looks like the watch is running about 20 seconds fast here, but I think that’s because they cut the “Tonight on 60 minutes…” part out of the video. What? Oh, face blindness. Sorry. 2:00 I have at least some facial recognition ability, because I can recognize most of these celebrities. And the ones I have trouble with are possibly due to unfamiliarity with the celebrity rather than face blindness. But this is easier than real life facial recognition, because 1) I already know it’s a celebrity, and 2) the faces don’t move or start to wonder why I’m staring at them. 2:22 This camera shot is a more accurate representation of the task in real life. All those faces going by– how can I pick out the ones I’ve seen before? Do other people’s brains really do that automatically? If so, that’s amazing! 3:20 There’s no “Aha!” moment for me when the faces go from upside-down to rightside-up. It’s just the same image flipped. Most people don’t have to turn their heads to read words that are printed upside-down, do they? It’s the same for me with faces– if I don’t know them upside-down, I won’t know them rightside-up. But flipping the image seems to cause instant recognition for Lesley Stahl. 4:45 When you don’t automatically recognize faces, you use context to help you keep track of people. If I understand what Dr. Novotny is describing, she can become familiar with a person as her current patient, but when they step outside into a crowd of people, their context is completely changed. Now they are just one of many people visiting the hospital. She might remember that the patient was a young woman with medium brown hair, but now there might be three other people in the room who fit that description, and if she makes an assumption, it could be wrong. 5:08 This is a nightmare scenario for me. I would have to ask for the coworker’s e-mail address or try to text them, because even if he tells me his name, I will probably not recognize him in a different context. Whenever I arrange to meet someone, I am usually not looking for a face I recognize. I am looking for someone who fits the general description of the person I am meeting (age, gender, skin color, hair color, hair style, etc.) and who appears to be looking for me (by making eye contact or smiling when they see me). Until I am sure who they are, I hedge by pretending to recognize them in a way that is hopefully also plausible as simple friendliness if they turn out to be someone I don’t know. 6:00 This exact thing happened to me with a friend who changed her hairstyle between school quarters. She no longer had her hair in a ponytail, and that was enough to make me unsure that she was the same person until she greeted me by name! I don’t experience quite as much dissonance as Jacob Hodes appears to, though. If I saw a person change their hairstyle in front of me, they wouldn’t “disappear.” I know they’re the same person because they haven’t gone anywhere. 8:00 The interview with artist Chuck Close is probably my favorite part of the segment. I think he does a good job of explaining the thought processes a faceblind person uses to identify people, and showing how you can still be good at recognizing people by paying attention to details. I think I also recognized the picture of Leno by the chin and of Tiger Woods by the lips. I thought Tom Cruise was Doug Flutie, though. Until I read about face blindness, I thought this was how everyone recognized faces. 10:00 I can echo what these people are saying. The idea that most people have a mechanism that instantly and automatically “labels” faces for them seems as weird and unexpected to me as face blindness appears to be to Lesley Stahl. Half the people I know say they are bad with faces, so I just figured I fit into the same category. Maybe I do, and it’s a spectrum like autism rather than a sharp divide between “normal” and “not normal” the way the segment makes it appear. 12:00 I haven’t had the experience of not recognizing my own face, but I don’t really need to recognize it very often. I mean, when I look in a mirror, the person in the mirror is going to be me, right? Other people stay on my side of the mirror. 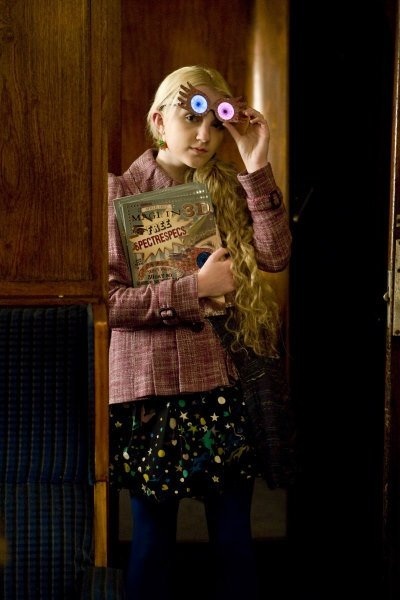 My family recently finished watching through the Harry Potter movie series, and I thought I’d write a bit about my favorite character in the story, Luna Lovegood. As far as I’m concerned, Luna steals every scene she’s in. In case you’re not familiar with the series, Luna Lovegood is a wizarding student attending Hogwarts one year behind Harry Potter’s class. She isn’t introduced until the fifth story in the series, Harry Potter and the Order of the Phoenix. It’s not difficult to believe that we never saw her before year 5, though, because she mostly keeps to herself, and no one wants to talk to her because she seems very strange. Luna’s mother died when she was nine, and her father, Xenophilius (literally “lover of strangers/strange things”), is the editor of a paper called the Daily Quibbler, which is the magical equivalent of those tabloids they used to have in supermarket checkouts with front-page stories about Bigfoot being kidnapped by flying saucers. 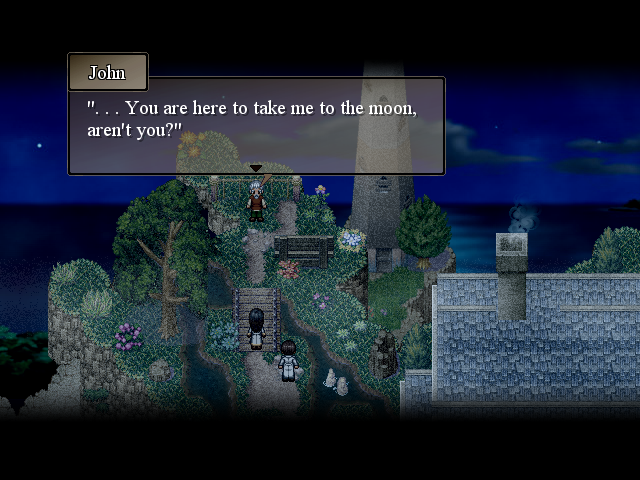 No one takes such things seriously, except apparently Luna, who is always talking about magical creatures that no one (not even wizards!) has ever heard of and making other observations that seem to come from nowhere. She tends to speak in a soft monotone and stare with a distant, almost expressionless gaze. 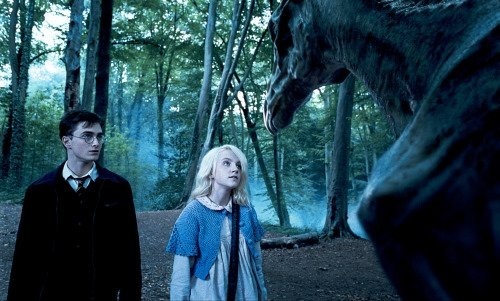 Luna (Evanna Lynch) introduces Harry Potter (Daniel Radcliffe) to a thestral. Such discussions almost always become quite tricky. Even moreso than with a real person, a fictional character is shaped by the reader’s own perspective– he or she originally exists in the author’s imagination, but then each reader’s imagination “fills in the blanks” in its own way when picturing a character. The nature of Asperger’s syndrome itself makes the prospect of “diagnosing” a fictional character even more nebulous. Asperger’s itself is just a label for a set of traits that are often observed together– actually, not unlike a story. It defines a rather blurry category, but the traits themselves do not describe any person exactly. Nor does every person with Asperger’s look, think, or behave the same. All of this is meant to explain that I’m not trying to argue that Luna Lovegood has Asperger’s syndrome. I think that people in a lot of different situations can identify with her. What I’m more interested in is describing the aspects of Luna’s personality and behavior in the movies that I identify with as a person with Asperger’s (and perhaps also a fairly quiet/shy person). I’ve been wanting to continue posting about what I was like growing up, hopefully to help people understand Asperger’s syndrome better. But I’ve been a little nervous about writing this part, because it feels a bit like bragging. It’s honestly not my purpose to boast, though, and I hope it will make sense once you’ve read the rest. Hans Asperger described the children he studied during the 1940s as “little professors,” because they tended to study a specific interest in great detail, and then repeat the facts they had learned to anyone who would listen. They would use formal language as if they were delivering a lecture, an effect that can seem comical coming from a young child. I definitely had the “little professor” trait. I learned to read when I was quite young– I honestly can’t remember not being able to. My favorite sort of books to read were reference books that used pictures and symbols to communicate information along with words. I would spend hours reading these books over and over again. What sorts of things captured my interest? Road maps. A long while ago, I posted a funny story about how one year I said my favorite Christmas gift was a Philadelphia road map. I was fascinated by the symbols used on maps for different types of roads and the names of the roads themselves. I could watch for the road names on signs when I was riding in the car and figure out where all of the places we visited were. At home, I would spread the map out on the floor and use highlighters to trace paths on it. When my youngest brother Andrew was born, I told my grandparents how to get to the hospital when I went with them to visit my Mom for the first time. I was four years old. The states in the U.S.A. and the countries of the world. I had an old atlas in my room that I turned through until the pages were falling out. I liked how each country was marked by a change in color and had its own flag. Finding all of the countries on each map was like a game, especially in the case of tiny ones like Liechtenstein. Before long, I could draw a map of state or country borders from memory. The bones and organs of the body. Another of my favorite books was a human anatomy book; it was like a map of the inside of the body. I liked learning all of the strange names for bones– vertebrae, phalanges, scapula, femur– and I could feel where they were inside me. I read about the path that food takes through the body after you eat it. I learned about the circulatory system (heart and blood vessels) and respiratory system (lungs). I liked how I could ask my Dad, the doctor, any question, and he would know the answer to it. Astronomy. I loved learning facts about the planets. Each one has its own day (Jupiter’s is 10 hours; Venus’s is 243 days) and its own year (Mercury’s is 88 days; Pluto’s is almost 250 years). On some planets, I would weigh just a couple of pounds; on others, I would weigh a ton. Then there were the constellations– 88 of them, just as many as there are keys on a piano. I had a wonderful book by children’s author H.A. Rey that taught me how to recognize the brightest constellations in the sky, but I wanted to learn about all of them, even the ones without any bright stars, like Lacerta the lizard and Camelopardalis the giraffe. I’ve been thinking about why children with Asperger’s display the “little professor” behavior. Some of the writing I’ve seen on the subject argues that these children are merely “parroting” information they’ve heard or read and don’t really understand the complicated subjects they are talking about. Like me, she grew up before anyone knew about Asperger’s, which in her case led to a lot of misunderstandings and hardships when her behavior just didn’t seem to make sense to those around her. Some parts of her story are very sad, but I think she tells it very well. There’s a lot in it to think about, as it relates to both children and adults with autism. I’ve been wanting to describe a little more about my own experiences growing up (a process I’m not done with yet!). Reading this account again makes me thankful for parents, teachers, and classmates who were willing to let me do my own thing or overlook my weirdness at times; I was spared a lot of unnecessary hardships because of the kindness of others. I hope I can post more soon! Since I quoted Carly Fleischmann in my post yesterday, I wanted to share the video I saw about her online. She also blogs and posts on Twitter. One of the things I thought was interesting about the video was that writing was not an easy process for Carly, even though she had plenty to say. The first time she tried writing, she threw up after it was done. It took months for her to write again after the first time she tried it. The video shows how excruciatingly slow it can be even now for her to get the words out. Honestly, I wasn’t expecting that, but it makes perfect sense. If this had been a movie script instead of a real-life story, I’d imagine it would show someone who had never been able to communicate in words before being incredibly relieved and suddenly writing great volumes of words. But this isn’t a movie script. Writing isn’t easy, and I think it can be even tougher if you’re accustomed to your thoughts going a lot faster than you can write. I can identify with the experience of being stuck in front of a blank screen for hours, or erasing and rewriting the same sentence again and again, and I don’t experience the painful physical sensations that Carly writes about. One of the most interesting things to me about the video is how it shows her perseverance. I hope and pray that the video will help people to understand autistics a little better; I think it has done so for me. Another thought that occurs to me is that I also hope parents of autistic children don’t expect them to be exactly like Carly. There’s only one person like her in the world, just like there’s only one person like me, and only one person like your child. Everyone has their own personality, strengths, and weaknesses. A friend of mine shared this video with me, and I wanted to post it here. This video was made from an audio recording of a 12-year-old boy named Joshua interviewing his mother. Animation was added to go with the audio. It’s really sweet, and I can see a little bit of myself in him. What about girls with Asperger’s syndrome? Doctors are ‘failing to spot Asperger’s in girls’ by Amelia Hill, April 12, 2009. The article quotes Dr. Judith Gould, director of the UK’s National Autistic Society. In 1979, she and Lorna Wing co-wrote a paper that helped to begin the process of defining Asperger’s and the autism spectrum. The British government is forming a strategy on dealing with autism, and Gould is pushing for an effort to pay attention to girls on the spectrum. One problem that you can run into in science is that forming a theory requires making assumptions, and if you’re not careful, those assumptions can be self-reinforcing. If you go back to the posts about defining Asperger’s, you’ll remember that the syndrome is defined by a set of outward characteristics that seem to go together. Most of the people diagnosed according to those characteristics are male, which leads to the expectation that most of the people who will be diagnosed will be male. And because Asperger’s is still such a new diagnosis, even a lot of professionals don’t know a lot about what to look for. I have read accounts of girls being told “You can’t have Asperger’s; you’re a girl,” even when they believe the traits of Asperger’s actually do describe them quite well. In addition to that problem, what if the definition itself is biased because it is based on what Asperger’s typically looks like in a male? Might it not be the case that the same cognitive condition might tend to have different outward signs in females than in males? The differences in behavior between genders are not all due to physical differences in the brain. There are a lot of societal and cultural differences in the things that boys and girls tend to do, and in the ways that they are expected to behave. It seems quite reasonable to me that Asperger’s syndrome would tend to look a bit different in girls than in boys, and we won’t know what to look for until we pay attention and look for it.